Without a doubt the most popular recipe I have, not only here on the blog, but on my YouTube channel as well, is the Tres Leches Cake recipe. I am really amazed to see that it’s been so well received by so many people. A lot of you have left me many comments letting me know how much you loved it and how easy it was to make, and many others have sent me photos of your final cakes which I have happily shared in my Facebook page. So, of course, a lot of people also want to make it a little different and they have asked time and time again how to add color to the whipped cream and also how to add different flavors. The most popular being chocolate! 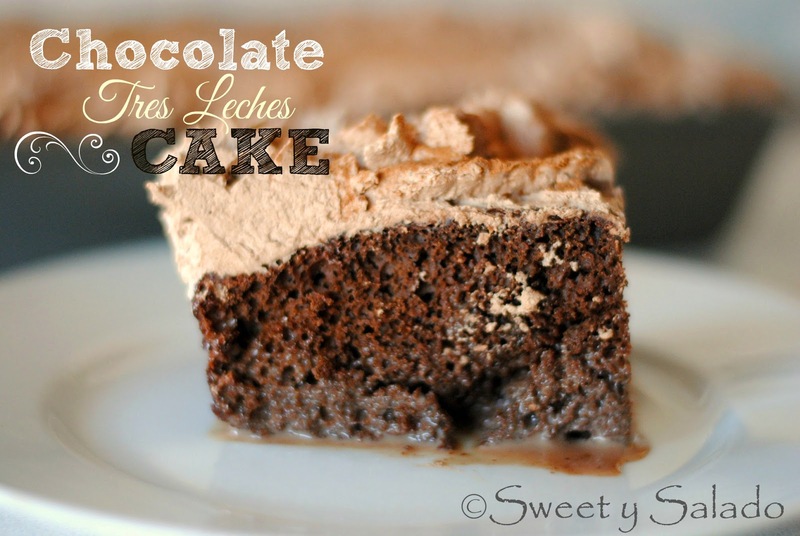 I have made plenty of regular chocolate cakes in the past and chocolate whipped cream as well, but I had never made chocolate tres leches cake until a few months ago and the recipe I came up with turned out amazing. All I did is add cocoa powder to everything, the batter, the milk mixture and the whipped cream, which I will post next week, so stay tuned. Another great surprise I have for you is that for this recipe I am collaborating with Julie who is the creator of Coookedbyjulie, an outstanding cooking channel on YouTube. 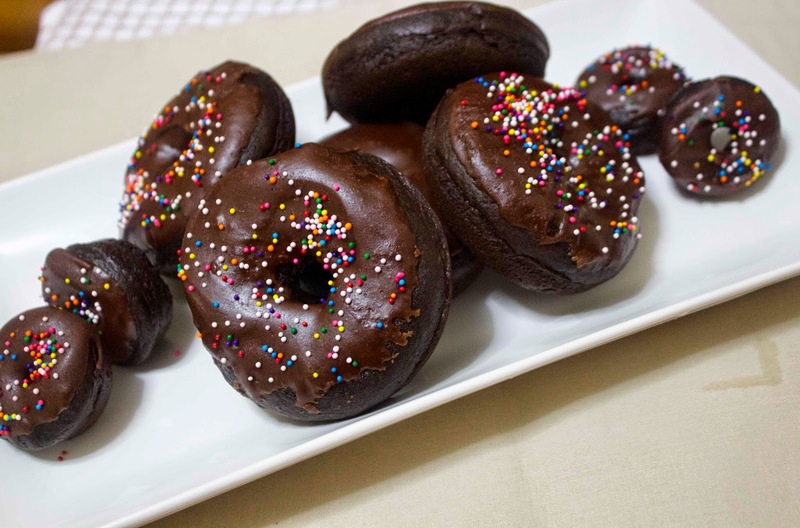 In Julie’s channel you will find a long list of delicious recipes including the one she’s making for our collaboration, chocolate doughnuts!! How awesome is that?! Please make sure to pay her a visit and also subscribe to her channel, you won’t regret it. 1. In a medium bowl mix flour, baking powder, cocoa powder and salt. Set aside. 2. Whisk egg whites until frothy. Then, slowly add sugar while whisking at high speed until it thickens, approximately 3-5 minutes. 3. Add egg yolks one at a time while mixer is still running and mix at high speed for another 3-5 minutes until they’re blended thoroughly. 4. Add half of the flour mixture and keep mixing until it is well blended. Then, add the milk and the vanilla extract. Finally, add the remaining flour. Keep mixing for about 3-5 more minutes until everything is well blended. 5. Grease and flour a 9 x 13 inch (23 x 33 cm) baking pan pour in the batter. Tap a few times so the air bubbles rise to the top and bake at 350ºF (180ºC) for about 20-25 minutes or until a knife inserted in the center comes out clean. Let baked cake cool inside the pan on a cooling rack for about 10 minutes. Then, take it out of the pan and let it cool completely on the rack. 6. In a small container mix the sweetened condensed milk, evaporated milk, heavy cream and 3 tbsp of cocoa powder. Mix well and set aside. 7. Put the cake back in the baking pan and poke it all over with a skewer or fork. Then, slowly pour the milk mixture over the cake. Cover it with plastic wrap and let it rest in the refrigerator for at least 4 hours, preferably overnight, this is to let the cake absorb the milk mixture completely. 8. 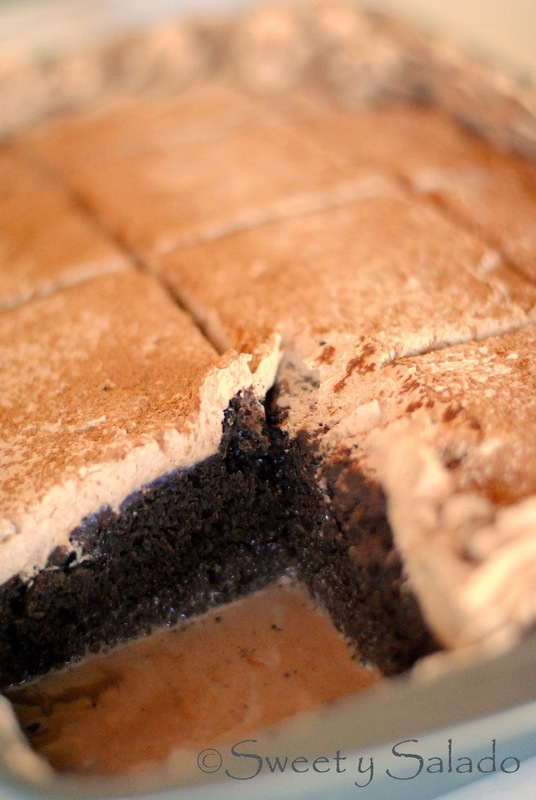 Once the cake has absorbed the three milks mixture, cover it with chocolate whipped cream and serve. Hi how are you? Wanted to ask if you have the recipe for the whipped chocolate cream? ��duhhhh i found it …it was right in front of my face!!!! Thank you will try this! Hi there! You can use the recipe for the cake itself, which is a chocolate spongecake, to make cupcakes, they will just cook faster in the oven, so keep an eye on them. Adding the tres leches mixture would be a bit more difficult because I'm pretty sure it will leak, so if you still want to add it, make sure you don't add a lot to each cupcake. Hello Ishmael, one of the main reasons why a cake comes out flat is usually because the flour was mixed for too long. What that does is overwork the gluten and it gives you a tough, flat cake. The batter should not be that thick so it makes me wonder if you were using measuring cups or a food scale to measure the ingredients, because the amount of flour is not that much compared to the other ingredients. Another reason could be because the eggs were not beaten enough because they're the ones giving this sponge cake its volume. Also, make sure the baking dish you're using is the size that I use in this recipe. If it's larger, then the batter will spread out more and it will come out flat. I was using measuring cuos. I measured 1 1/2 cups flour. I used a 9×13 pan… I only mixed the flour by hand to bend right. Makes me wonder if the eggs were not beaten correctly.I saw you did a nice job. My batter was thick and not like yours.also, I used stevia instead of sugar. Yes, the egg whites and the egg yolks need to be beaten quite a bit to get a nice texture and volume. Since this is a sponge cake, which means it doesn't have any butter or oil, you need to beat the eggs really, really well. Hello mommy of 5, one of the biggest issues people have with sponge cakes like this one is over mixing the flour. This over develops the gluten in the flour giving you a tough, dry cake. Since this is a sponge cake, the egg whites and the yolks need to be beaten really well to create volume, but once the flour is added, it needs to be mixed only to incorporate it. What cocoa powder should i use? I usually use either Hershey's or Nestle's unsweetened cocoa powder.